Sometimes things “just looks wrong”, and this is almost always related to the dimensions or scale of one model against its surrounding environment. let’s deviate for a moment.. There are a number of reasons for this, including the fact that when the focus is on very close objects, everything in the foreground and background is blurred. This makes things look small. In big screen movies such as Star Wars and lord of the rings, lenses are used to keep the entire scene in focus, which makes it look huge because that’s how big things look to us. In (old) Godzilla movies, the foreground and background are often out of focus, which reveals the models as being much smaller. Texture is important too. Huge things tend to be quite textured and have a lot of little detail, while small models tend to be more “perfect”, less worn and fake looking. In Godzilla, the tanks don’t have the tiny little scratches or dust or whatever else a real tank would have. This contributes a lot to the realism of an object. Another lesson from the movies is that change in focus is inversely proportional to distance. That means that the change in focus between, say, your keyboard and your monitor is much greater than the change in focus between two mountains that you can see. The mountains could be miles apart, instead of inches for your desktop, but the change in focus is small. So when you can see several different layers of focus, both stuff that is too close to be in focus and stuff that is too far away to be in focus, as well as stuff that is at the perfect distance all at the same time, you think that the subject must be small and close by because that’s how things small and close by look. This is because of how we associate perception in our minds. The closer you get to something the more you see. And generally said object gets bigger. The lesson here is that your model railway will most probably be viewed from different angles and distances, and you need to take this into consideration. One example of how modelers cleverly trick your eyes, is with the use of forced perspective, while other modelers mix buildings, and figures in different scales to build their scenes. G scale is a broad scale. In model railroading, there are a number of train and model railroading manufacturers that make trains and accessories in what they call “G” Scale, but they actually vary is scale between manufacturers, from 1:20, 1:22, 1:24 & 1:25 (1/2″ scale). Because 1/2 Scale or (G) Scale or 1:24 Scale items are hard to find, most scale modelers will mix and match the use of items across the spectrum of the scale. The scale numbers mean nothing if you don’t have the dimensions of the original item. So … if you are looking at a miniature building which has a standard front door of a height of approximately 1″ high, then that miniature building will be approximately “HO” scale. … If you are wanting to build a scale model of your house, which is approximately 15m (50 feet) wide, and you want the model to only be approximately 30cm (12 inches) wide, then you would need to model the house in “O” Scale. O Scale equals 1/4″ = 1′. 50(feet) x 1/4″ = 12.5″. Z SCALE – (Proportion Ratio 1:220. Looking at the front of a typical Z Scale train engine or boxcar, the dimensions are an average 0.75″ High x 0.5″ Wide.) Z scale was developed in by Märklin in the early 1970’s, and is the smallest of all the working models — so tiny that a little layout will even fit in a briefcase. Most Z trains and equipment are based on European railways. N SCALE– (Proportion Ratio 1:160. Looking at the front of a typical N Scale train engine or boxcar, the dimensions are an average 1″ High x 0.625″ Wide.) This scale is an ideal choice for apartments or anyone with limited space. N-scale trains are easy to store when not in use and are ruggedly built for trouble-free operation. The small size is fine for teenagers and adults; younger children will need an adult to help to set up or take down a set. HO SCALE– (Proportion Ratio 1:87. Looking at the front of a typical HO Scale train engine or boxcar, the dimensions are an average 2″ High x 1.5″ Wide.) “HO” means “half – o;” models are half the size of O Scale. HO is the most popular scale with the greatest selection of sets and accessories, as it allows lots of railroad action in a small area. Children may need adult help to set up or take down the set. S SCALE– (Proportion Ratio 1:64. Looking at the front of a typical S Scale train engine or boxcar, the dimensions are an average 2.75″ High x 2″ Wide.) (American Flyer) S Scale trains appeared in the 1950s (American Flyer was one of several popular brands) as houses grew smaller. Its chief advantage was size; larger than HO for more detail and improved reliability, but smaller than O Scale so less room was needed for a layout. Today, the selection of kits and assembled items is small, but this has made S Scale popular with modelers who enjoy the challenges of scratchbuilding and kitbashing. O SCALE– (Proportion Ratio 1:48. Looking at the front of a typical O Scale train engine or boxcar, the dimensions are an average 4″ High x 2.5″ Wide.) (also On30, 027, O-31) (Lionel, MTH, Williams, K-Line, Weaver) O Scale trains also include “On30” Sets, which are O Scale models that run on a narrower track — just 30 scale inches wide. They’re ideal for use with Christmas Villages. “O27″ gauge sets will take tighter curves — which makes these O Scale sets a good choice when space for bigger trains is limited. (The number 27 refers to the 27” diameter of a full circle of track.) If you grew up with Lionel trains, you’ll remember that they were O Scale models. Ruggedly built, they’re a good choice for youngsters or permanent layouts. Many sets feature animated accessories. “HO Scale” – A generalized size in the slot car world. Originally 1:76-1:87, in the 1960’s, now usually closer to 1:64 scale. HO Slot Cars vary in size, running from 1:87 (generally the older cars) to 1:64 in scale; but they all run on HO track of approximately the same width, and are generically referred to as “HO” slot cars. A typical HO slot car’s length is from 2.5 to 3.5 inches (5.5–8 cm). As with HO scale trains, one can create a very large race course, in scale, in much less space than the larger scale slot car sizes. The HO race cars are not typically advised for younger children as the cars are smaller, more delicate with operating parts that can easily be broken, if not handled appropriately. Many manufacturers advise for ages 12 years and older. Though there is HO racing on commercial and shop-tracks, most HO racing occurs on home racetracks. “1:43 Scale” – This scale of slot cars and race sets, introduced around 2005, are generally marketed as children’s toys. An average 1:43 slot car’s length would be 4.3″ (10.9 cm). More recently, this scale has had an increased following, and at least one manufacturer has come out with “digital” version two-lane race sets, allowing for individual controlling of multiple cars in the same lane (slot), that can merge, switch lanes and pass, running up to 6 slot cars on a two lane track with 6 separate hand controllers. “1:32 Scale or 1/32” – This scale of slot cars are approximately twice the size of “HO” scale; and larger than the “toy” 1:43 scale. Very popular with both children and adults, the 1:32 Scale slot cars are more durable than HO Scale. The 1:32 Scale slot cars generally have a lot of detail and are truer to the scale and detail to design of the “real thing”. Because of the detail, many enthusiasts will just collect the cars, similar to diecast model collectors. Because the 1:32 Scale slot cars are twice the size of HO scale, it would require twice the space to do the same race course layout that would be accomplished in the HO scale. However, most slot car manufacturers offer a large variety of very challenging and fast race course layout designs, with plenty of straight aways and curves, right out of the box, that will easily fit in a 4′ x 8′ area. Though this scale slot car racing is more suited to home-sized race courses, these scale cars are also widely raced on commercial tracks, in hobby shops or in clubs. 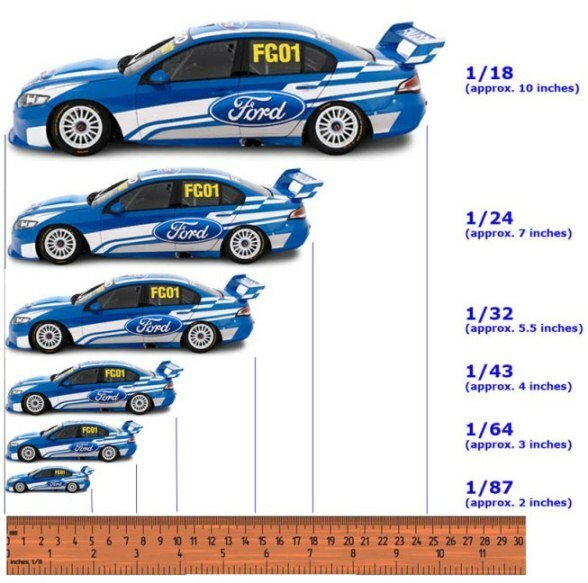 A 1:32 car averages 5 to 6 inches (13–15 cm). Scalextric, SCX and Carrera have designed straights and curved track pieces to accomplish race track layouts with straight tracks and curves that are 8 lanes wide. Many slot car racing enthusiasts do this to replicate commercial raceway layouts, and to allow more family and friend racers to participate at the same time. More recently, with the popularity and growth of interest in this scale, at least three manufacturers, including Scalextric, SCX and Carrera, have come out with “digital” version two-lane race sets, allowing for individual controlling of multiple cars in the same lane (slot), that can merge, switch lanes and pass, running up to 6 slot cars on a two lane track with 6 separate hand controllers. “1:24 Scale or 1/24”– This scale of slot cars are the largest slot cars commonly raced. A typical 1:24 slot car might be 7 to 8 inches long (18–20 cm). Unless you have a lot of room, or a big basement, 1:24 cars require a course so relatively large, that it is impractical for many home enthusiasts. So most serious 1:24 racing is done at commercial or club tracks. “Scale” is the relationship between the size of two items. In model railroading, it is generally expressed as a ratio. For example: HO scale is 1:87, that is one inch on the model to 87 inches in the real world. This chart shows the average man in common scale in model railroading.